In the second half of the 1960s conventional wisdom in the automotive world said sportscars had a mid-engine layout (mostly down to Lamborghini’s 1966 170-mph Miura). Having reached the end of the 275 GTB/4 evolution Ferrari needed something new. But Ferrari somewhat shocked the viewers at the 1968 Paris Auto Salon by unveiling another front-engine design. However, the new Ferrari 365 GTB/4 would go on to be generally regarded as one of Ferrari's greatest ever GT's. 365 GTB/4 (365cc per cylinder with 4 over head cams), isn't a very evocative as a name and the press soon christened the design the “Daytona”. 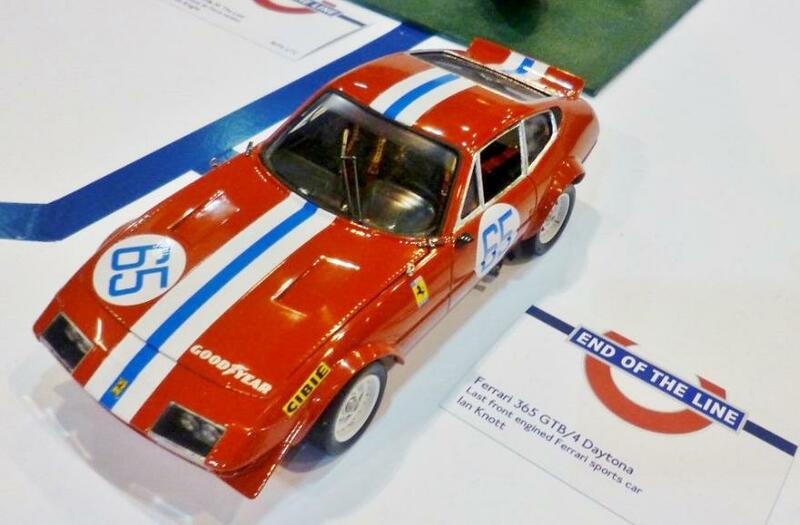 This unofficial title is said to be in honour of Ferrari's 1-2-3 victory in the 1967 Daytona 24-Hour race and although never used by the factory is the more commonly used name for this model. The 365GTB/4 was always going to be historic as it was the last road car designed and built by Ferrari before Enzo Ferrari sold 40 per cent of the shares in his company to Fiat in June 1969. Ultimately it also became the last front-engined sportscar from Ferrari for decades and was the last 12-cyl Ferrari available new in the USA (through official channels) until the 512 Testarossa went on sale in 1985. Sergio Pininfarina had been pressing Enzo Ferrari to look at his mid-engined designs and had been repeatedly rebuffed, when he saw Fioravanti’s stunning design ideas for Ferrari's new front-engine car, he was delighted. This was actually before Ferrari had designed their new car or even decided that they had to go ahead with a new car. Sergio Pinninfarina took Fioravanti’s general 1966 design lines and refined them to add the aggressive sharp nose and the abrupt angled Kamm tail. Once Pininfarina had contributed to Fioravanti's work the very modern look of “lightness and rake” was achieved. An interesting feature of the design is the semi-circular indent line running from behind the front wheel arches around the perimeter of the body with just small hints of the idea under the front indicator lights. One popular rumour was that Leonardo Fioravanti designed the Daytona in just 7 days, a rumour he later confirmed on a US motoring TV show, however this is probably not the case. Ferrari retained it's traditional chassis design using welded oval-section tubes, large-section oval main tubes had cross bracing tubes and sub-structures to support the body etc. wheelbase was set at 94.5-inch (2400mm), with a wide track (front-rear 1440 mm / 56.7 in - 1425 mm / 56.1 in). Suspension was independent all round by virtue of unequal A arms, coil springs were damped by tubular shock absorbers, and body roll controlled by anti-roll bar at the front. The large disc brakes had improved ventilation to aid cooling under hard use. Five spoke “star” pattern alloy wheels were standard with Borrani wire wheels as an option. The wheels were secured with a knock-off spinner on a Rudge hub in Europe but for America, and certain other markets, a large central nut was used due to legislative requirements. The early Daytonas had perspex covers for the lights but when it came to US legislative requirements the main head lamps were moved into the wings with a pop up system which allowed Ferrari to keep the cars lines while the lights were uncovered as per US regulations when they were in use. The engine and transmission were developments of earlier Ferrari ideas. Colombo's 60° V12 twin overhead camshaft Tipo 226 engine from the 275GTB was lengthened and enlarged from 3.3 to 4.4-liters, 4390cc to be exact, with a bore and stroke of 81mm x 71mm respectively. Dry sump lubrication helped keep the centre of gravity low even though six twin-choke Weber 40 DCN 20/21A carburettors sat atop the engine with a twin coils and distributors driven of the rear of the outer camshafts. Power output was quoted at 352hp at 7500 rpm giving the car a top speed of 174mph with a 0-60mph time of just 5.4 seconds. All this made the Daytona the world’s fastest production car at that time. The engine sent power to the rear wheels through a flywheel-mounted clutch and a drive shaft in a torque tube to a five-speed transaxle mounted similarly to that of the 275 GTB4. Having the rear mounted transaxle aided weight distribution and handling. 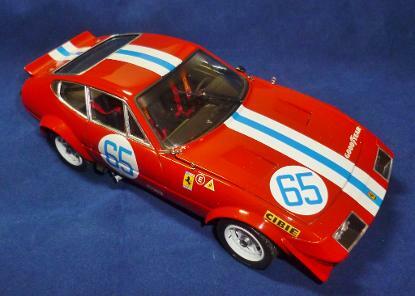 Further models were the GTS/4 and the competizione. Fioravanti had never envisioned a convertible Daytona but Sergio Scaglietti and Sergio Pininfarina contrived to produce a variation on the GTB cars form. The “speciale” one off coupé was featured at the 1969 Paris Salon. It had a stainless steel roll hoop and a zip out rear window, although the roof section was a fixed panel. By the time of the Frankfurt Show in '69 a spyder 365 GTS4 was announced. Visually identical to the GTB from the waist down with only the folding roof and boot profiles being different. Production of the Spyder GTS commenced in 1970 and 122 units were built, almost 80% of which were sold in the U.S.
For racing clients 15 racing or “competizione” cars were built in three batches of five units. As part of Ferrari's “Assistenza Clienti” program 15 special competition versions of the Daytona were built. The catalyst for this had been Luigi Chinetti’s North American Racing Team's 1969 one-off all-aluminium bodied car for le Mans that year. It had flared wheelarches and wider wheels. 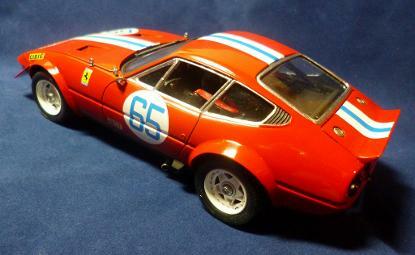 Ferrari built the cars in three series of five cars per year during 1971, '72 and the final series in '73. As well as aluminium and fibreglass panels and plexiglas windows the “competizione” cars had carefully built and balanced racing engines reaching an output of 450bhp (336kW; 456PS) in 1973. 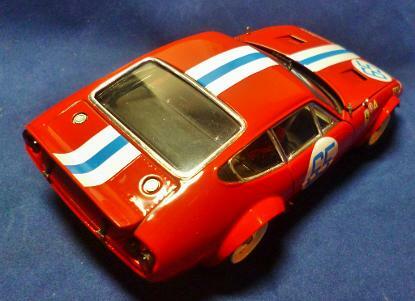 This racing program was also enhanced by homologation of special parts as the period of production for the 365GT/4 continued. The cars proved successful in GT categories due to their power and reliability, so much so that in the 1972 le Mans 24hrs race they filled the top five positions in their class and went on to gain the same class victory again in '73 and '74. As late a 1979 these cars were still able to perform most creditably with the subject of our model, chassis #16407, taking 2nd overall in the 1979 Daytona 24-Hour Race. Our model is in the specification it had for it's last competitive race, the 1980 Daytona 24hrs. Entered by Nicholas/McRoberts Racing, chassis #16407 driven by John Morton & Tony Adamowicz (Bob Bondurant was also listed but never drove), the car was running 4th overall when a rear stub axle broke and the car shed it's left rear wheel. This happened close enough to the end of the race that the car was classified as 14th position. Not bad from a starting position of 29th on the grid. Built by Ian in October 2015 to be ready for that years Scale Model World show the model made it's first appearance on the IPMS Stafford display titled "The end of the line". It is mostly straight from the box with some alterations to create a more accurate impression of the actual race car. These additions are in the form of scratchbuilt internal roll bar, indicator covers, front aero flaps and the rear aero flip up on the boot. The fuel fillers were relocated to the boot lid and Archer rivet decals were used to create the rivet look on the bonnet and boot. The rear bootlid flip up was constructed of two pieces of Evergreen plastic strip, one laid horizontally in line with the boot lid and the second stood vertically on the first at the rear edge. After the slopes were built up with filler the whole area was sanded down smooth and tapered to get the right appearance. The front aero flaps are just plasticard cut and sanded to shape. 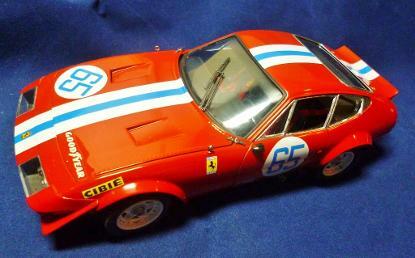 The body paint is "Plamo UK" Ferrari red which was custom mixed for me by Plamo and applied by airbrush. It is then covered with Plamo 2pak super gloss and the decals are sealed with Johnson's clear. Bare metal foil has been used for the window frames. All the parts were primed with Alclad II white of black primer/micro-filler. 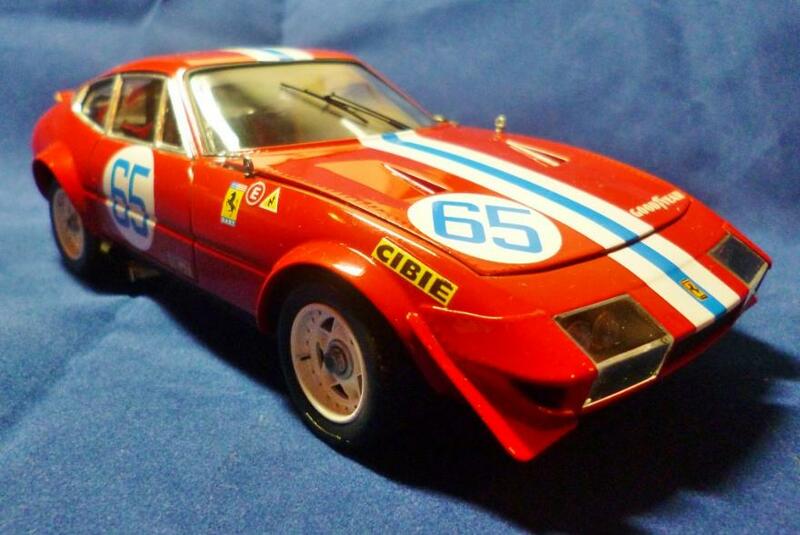 Italeri kit #669 was first released in 1983 off the back of the road going Daytona kits (#661 and #665 for the roadster). It shares most of the same parts with a few additional racing style items like the bonnet and boot catches. AcuStion, Crazy Modeller and others have done detail upgrade sets for this kit and given that the engine in the kit is so nice these additional sets really should be considered. In fact one of the reasons this kit sat in Ian's "Stash" for 20 years was that it really does deserve to be fully detailed. All the basics of the car are there so adding the super details should be straightforward.